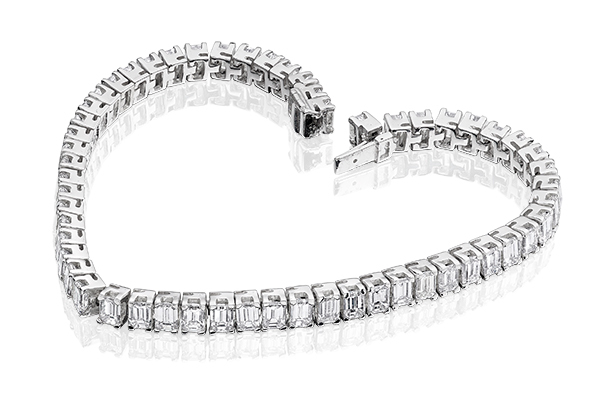 A diamond line bracelet – 55 fine emerald cut diamonds set in platinum or 18 carat gold. The diamond line bracelet is also known as an eternity bracelet and a traditional gift of love from a man to his wife or fiancé. The concept of the unbroken circle that represents eternity, encompassing the full meaning of marriage and family life, comes from the days of Ancient Egypt. This bracelet and many other smooth,sensuous diamond bracelets can be found on www.flexi-linkbraclets.com. The Feast of St. Valentine on 14th February, celebrated throughout the world as the day of love and fertility, was first established in 496 by Pope Gelasius I, but very little is known about the life of the Roman Bishop Valentinus. In fact, there were three possible contenders for the honour, of which the most likely was a young priest who was martyred for opposing the decision of the Emperor Claudius to forbid young men to marry – he believed that married men made bad soldiers! Bishop Valentinus carried on conducting weddings in secret for young men and soldiers, for which he was imprisoned, tortured and finally beheaded. Many myths and legends surround the romantic Bishop – one being that he fell in love with the jailer’s daughter, Julia, to whom he wrote just before his execution, signing his letter “from your Valentine”. And so, many hundreds of years later, the tradition was firmly established and an estimated one billion cards are sent out each year on the 14th February in the name of love! It is said that Julia planted a pink almond tree near his grave and today, the tree with its pink blossoms is a symbol for romantic and eternal love. St. Valentine is now buried in the Church of Praxedes in Rome. Another theory about the origins of this feast day, is that Pope Gelasius I was attempting to replace the pagan Roman festival of Lupercalia, god of fertility whose festival required human sacrifice,with a rather less blood-thirsty Christian one. Valentines Day is recognised as a feast day by many religions across the world, including the Anglican, Lutheran, Eastern Orthodox and Greek Orthodox Churches. Another more prosaic proposal, is that Valentines Day was created by Geoffrey Chaucer in the 15th century as the first mention of a day of romantic love is in his poem, Parlement of Foules, written to celebrate the engagement of King Richard II of England to Anne of Bohemia in the 14th century. The Feast is celebrated on 14th February in many countries of the world by giving chocolates, cards and gifts of jewellery. It is also the day chosen by many couples to renew their marriage vows, and the Anglican Church holds a service for St. Valentine’s day in which the couples may have their marriage and their wedding rings blessed.